If you have an international shipment, you’ll choose to send it by sea or air. Both have their benefits and drawbacks. Sea shipping typically isn’t as fast as shipping by air, but it’s generally less expensive and its capacity is much greater. Shipping by air is on a tighter schedule, usually daily, so shipments typically get delivered on time, while sea shipments operate on a weekly schedule, so there’s more room for delays. If you decide sending your goods by sea is your best option, you’ll discover that there are many different types of ships that carry a variety of goods. If you’re new to the ocean shipping game, or to the shipping game in general, you may have some confusion when it comes to the type of carrier you’ll need. • Container Vessels: Container vessels are the most common mode of transport for shipments in containers, with the most common container sizes being 20’, 40’, and 45’. These types of vessels come in various capacities, and can carry a number of different cargos. • Bulk Vessels: Bulk vessels carry bulk commodities, or ‘loose’ cargo, like grain, coal, iron core, etc. They come in a variety of sizes to suit the amount of cargo freight needing shipped. • Breakbulk Vessels: Breakbulk vessels carry different types of goods that need to be loaded individually, like bagged cargo (cement, sugar, flour, etc. ), palletized cargo (paint, chemicals, etc. ), timber, etc. • Ro-Ro Vessels: Ro-Ro vessels carry any type of wheeled cargo, which are typically automobiles and heavy machinery. • Multi-Purpose Vessels: Multi-purpose vessels carry a combination of different types of cargo, and are very versatile – making them very popular vessels for cargo shipping. • Tanker Vessels: Tanker vessels carry different kinds of liquids, like oil and other chemicals. • Crude Carriers: Crude carriers carry, you guessed it, crude oil. There are two more types of crude oil carriers: VLCC (very large crude carrier) and ULCC (ultra large crude carrier). • LNG Carriers: LNG carriers are specifically made to carry liquefied natural gases. • Reefer Vessels: Reefer vessels carry goods that need to be frozen or temperature controlled. They commonly carry things like produce, meat, and fish. As you just read, there are a number of different types of cargo ships that can carry nearly anything you may possibly need to ship. 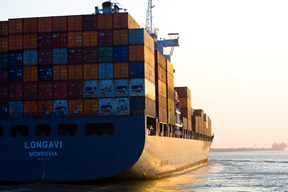 If you’re unsure of whether or not your shipment should be delivered by sea or air, Freight Rate Central is here to help.